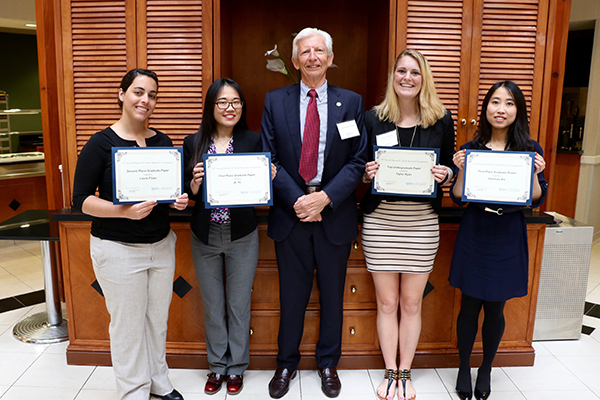 2016 Steele award recipients with benefactor Rodman Steele (from left) Laura Finan, Ai Ye, Rodman Steele, Taylor Ryan and Yanmiao Xie. The Steele Symposium is designed to promote research that improves lives and the community. 8:45 a.m., May 4, 2016--When keynote speaker Kevin F. Miller asked attendees at the University of Delaware College of Education and Human Development’s Steele Symposium what was the scarcest resource in education, he received one answer  time. Teachers are expected to squeeze in more responsibilities and produce better results within the same limited amount of time. “True, some charter schools extend their school day, requiring sometimes heroic efforts by their staff, but that is not a sustainable model,” said Miller, professor of a combined program in education and psychology at the University of Michigan. This is why Miller is an advocate of process improvement in the Spirit of Kaizen  taking small, incremental steps to change your world. The Steele Symposium is the embodiment of Kaizen. On April 29, UD students in education, human services, behavioral health and fashion presented their research, striving to identify initiatives that will improve the lives of children, families and the community. 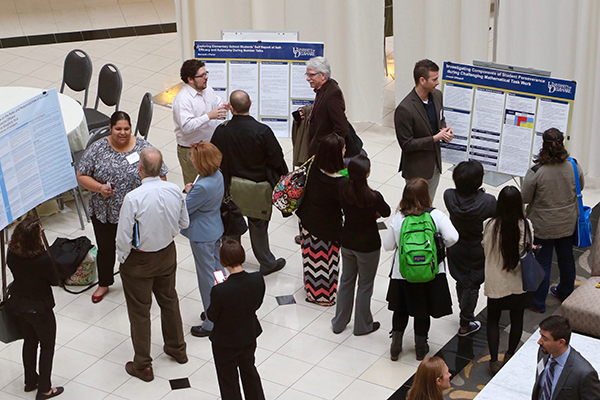 More than 40 students participated, explaining their work during a presentation or poster session. That was the goal of Marion Steele, a 1928 graduate of UD, who went on to excel in the fields of home economics and family and consumer sciences. The Marion H. Steele Research Symposium was established in 1986 by her nephew, J. Rodman Steele Jr., a 1963 engineering alumnus, to honor his aunt and her love of learning. Yanmiao Xie, Ph.D. in education, “Incentivizing Produce Purchases at Farmers Markets: Year 1 Results,” first place - graduate poster. Hrysoula Davis, Ed.D., “Linguistic Supports for English Language Learner Access to Rigorous Math: A Curriculum Analysis Toward Educational Equity,” second place - graduate poster. Ai Ye, Ph.D. in education, “Pathways from Cognitive Competencies and Numerical Abilities to Fraction Learning,” first place - graduate paper. Laura Finan, Ph.D. in human development and family studies, “Parent, Peer and Sibling Relationship Factors and Depression in Adolescence and Emerging Adulthood,” second place - graduate paper. Taylor Ryan, human services, “Can Public Policy Help Reduce Poverty Among Individuals With Disabilities?”, top undergraduate paper. Stephanie Walker, early childhood education and human services, “Transracial adoption,” top undergraduate poster. The Marion H. Steele Research Symposium honors the memory of Marion Steele, a 1928 graduate of the University of Delaware. She spent her 41-year career at the American Home Economics Association and served as longtime editor of the Journal of Home Economics (now the Journal of Family and Consumer Sciences), until her retirement in 1969. Her legacy continues through this symposium, recognizing research that reflects the high standards of scholarly work to which she dedicated her professional efforts. It is sponsored by the College of Education and Human Development and the generous support of the Steele family, in cooperation with the Delaware Association for Family and Consumer Science. Her papers, donated by J. Rodman Steele Jr., are housed in the University of Delaware Library Special Collections and are available for research.